Over the last two years I have been increasingly puzzled about my own response to others. Let me explain. I have a huge respect for several people who know a lot about the faulty money system and how its flaws cause so much pain, misery and environmental devastation. I also have a huge respect for those who have led the movement for tax reform so we tax what we hold or take rather than what we do or make. Nowadays in New Zealand income tax, sales tax and company tax comprise more than 80% of our government revenue and our local authority’s funding system is more and more regressive. There are a growing number who know about both the shortcomings of the privately created money system AND the flaws of the tax system. To save myself pain, I have focused my attention on only those who see the shortcomings of both systems. Yet when I broached the topic of tackling both issues together I received the reply “Of once we have done monetary reform we can get into land tax issues” or “Land tax will deal also to the faulty money system” or “Monetary reform will stop housing bubbles”. And these answers from people I respect. Why did my hunch say NO? So it was a relief the other day when researching systems thinking to watch a 20 minute interview of the brilliant Frijtof Capra by Hazel Henderson. Capra was talking about living systems. He talked of the need to educate people eco-literacy and said there are multiple reasons why we are destroying our natural environment. A major one is that we are thinking linearly and not holistically. It is all too mechanical and Cartesian. He asked why do we want to save the spotted owl? The answer is because of the relationship of the spotted owl to humans. It is actually the relationships that we want to preserve. Ecosystems are communities that have organised themselves over billions of years. There is true wisdom in them. Capra says we are thinking in fragments and we need to connect the fragments. We need to think in terms of relationships not objects. And in Nature each living system is self-organising. We need to move from thinking about content to thinking about patterns, from content to context, says Capra. He says we can't divide up a living system because it breaks those relationships and destroys the patterns. 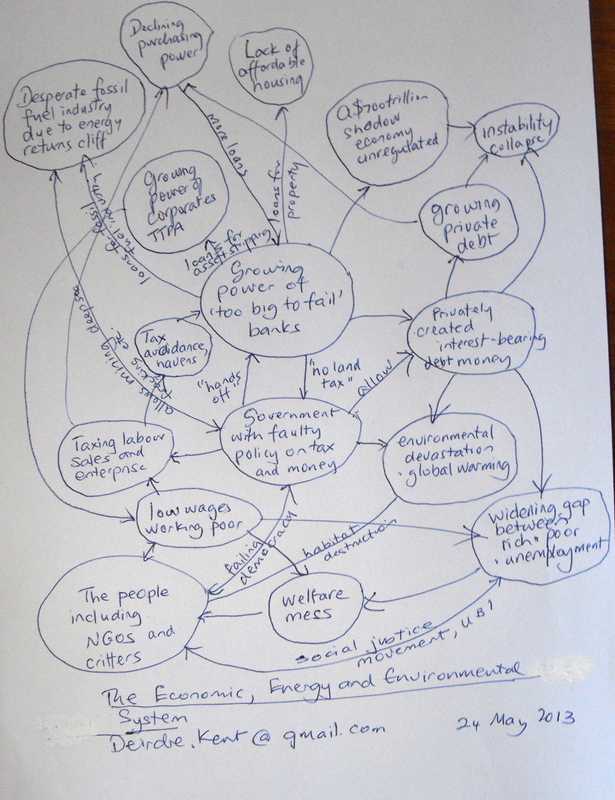 So I have been thinking about the relationships between the various BIG PROBLEMS we face in the global economic system and the global environmental system. Though there are points of difference or scale, on the whole the big problems we in New Zealand face as a nation are similar to those faced by other nations. If we focus on just one issue, say affordable housing, and forget about its relationship to bank created credit and a tax system which favours real estate investment, we will miss the target. Spain built more houses and it didn’t solve their affordable housing problem. If we think about the big problem of low wages for the working poor and just ignore its relationship to the tax system, the lack of investment capital for jobs and growing debt, we can come up with a temporary solution of a higher minimum wage. But it won’t solve the problem of the declining affordability of food and housing. You see if you ignore the living system in which the problem is embedded, the problem persists. If we focus on climate change only and forget the flawed money system which demands economic growth, we won’t get very far at all. The next international conference will deliver exactly the same result where politicians favour economic growth over habitat protection. If you focus on getting a Universal Basic Income and forget about the fundamental reasons for tax havens (a faulty tax system) and the growing private debt issue, you won't get very far. So I believe my instinctual response to those monetary reformers who insist we tackle one problem at at time is actually well founded. It is time we all looked at the system as a whole and then worked out where to change it, where to tweak it. Family therapists do this every day. They don't just focus on the difficult adolescent, they look at the family as a whole. Systems thinking works! This entry was posted in Living Systems thinking and tagged affordable housing, Capra, climate change, Intractable problems, living systems, living wage, systems thinking by Deirdre. Bookmark the permalink.